Wilson-Smith, Anthony. "Bicentennial of Sir John A. Macdonald's Birth". The Canadian Encyclopedia, 17 September 2018, Historica Canada. https://www.thecanadianencyclopedia.ca/en/article/bicentennial-of-sir-john-a-macdonalds-birth. Accessed 19 April 2019. As we mark the 200th anniversary of Sir John A. Macdonald’s birth on 11 January 2015, it’s worth considering his achievements, experiences and his flaws. Credit: Harold M. Daly/Library and Archives Canada/C-002079. Canada is known more for stability than for any particular sense of mischief or scandal. That makes it all the more surprising that the man considered most responsible for Canada’s birth as a nation was a fast-talking, crudely mannered heavy drinker with lifelong bad behaviour — but big accomplishments. 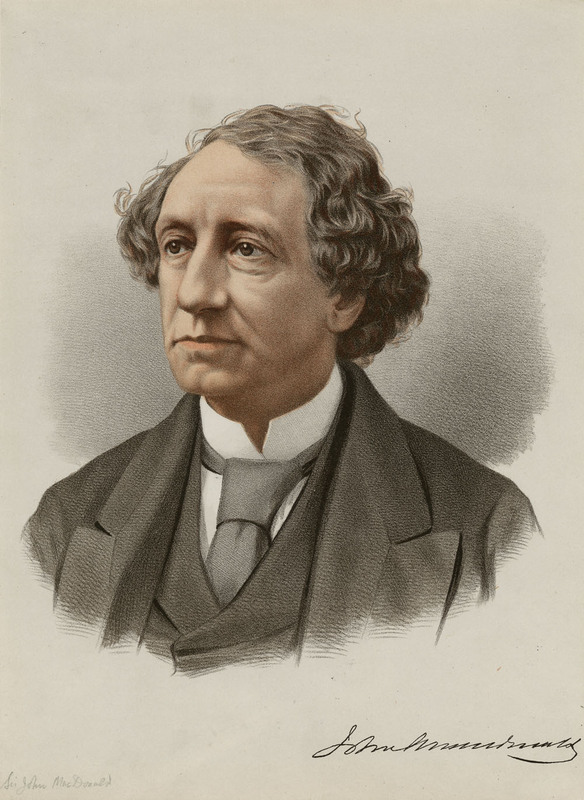 As we mark the 200th anniversary of Sir John A. Macdonald’s birth on 11 January 2015, it’s worth considering his achievements, experiences and his flaws. At age seven, he witnessed the killing of his younger brother by a drunken babysitter. By his late teens, he was a lawyer and occasional mischief-maker who successfully defended his own assault charge following a scuffle outside Hopkins Tavern in Picton, Upper Canada. As an adult, his behavior was marked by his public drunkenness, rough-and-ready tongue and partisan manner. To his continuing discredit, he sometimes made racist remarks about people of other backgrounds, including Asian	and Indigenous peoples. Despite that, Confederation might not have happened without the charm, pragmatism, shrewdness, determination and foresight that were part of his complex personality. Macdonald won six of seven elections, serving as prime minister from 1867 to 1873, and again from 1878 until his death in 1891. He built a country — against the objections of many — out of four new provinces Nova Scotia, New Brunswick, Ontario	and Québec. As prime minister, he expanded the country from sea to sea by building a national railway	and founding the North-West Mounted Police — forerunner to the Royal Canadian Mounted Police. Those efforts, among others, were enough to bring in British Columbia	and other Western provinces. Such achievements required exceptional ability to draw in others. When Macdonald became convinced of the need for a united Canada — in part out of concern that the constituent parts would be subsumed by the United States — he had to expand his support. That meant working with Liberal leader George Brown, even though the two men loathed each other. He recruited George-Étienne Cartier from Québec, and the three men worked together	despite the fact that Brown was renowned for his anti-French, anti-Roman Catholic prejudices. Cartier, in turn, had fought against British forces in the 1837 rebellion. But under Macdonald, they formed a common cause. Macdonald’s relationship with Indigenous peoples in Canada is more controversial. His biographer Richard Gwyn argues that he was further advanced than most contemporaries in his approach. Macdonald described them as “the original owners of the land… [and] the great sufferers by the discovery of America.” But the execution of Métis leader Louis Riel	remains a blot on his record — and other historians are harsher. In his book Clearing the Plains, historian James Daschuk alleges that Macdonald’s government willfully starved and subjugated Indigenous peoples in the Prairies in order to politically control and shape an immense region from Regina to Alberta during construction of the railway. As well, Macdonald’s government discouraged Chinese immigration to Canada through the creation of a head tax	that charged such newcomers a significant fee not applied to others. But defenders point to other evidence of Macdonald’s relatively advanced views — such as his push to grant women the right to vote, and the fact that some Western countries did not allow Asian immigration at all. Macdonald would likely receive all views dispassionately. Politics, he said, “is a game requiring great coolness and an utter abnegation of prejudice and personal feeling.” In one of his few declarations about his emotions, he summed himself up succinctly. “My sins of omission and commission I do not deny,” he said. “But I trust that it may be said of me in the ultimate issue, ‘Much is forgiven because he loved much’ — for I have loved my country with a passionate love.” A country that, with its own set of strengths and faults, continues to thrive today. Interested in Sir John A. Macdonald? Sir John Alexander MacdonaldA biography of Sir John Alexander Macdonald, lawyer, businessman, and politician. From the Dictionary of Canadian Biography Online. MACDONALD, Le très hon. sir John AlexanderFiche de parlementaire de sir John Alexander Macdonald. Par le site Web de Bibliothèque du Parlement. Sir John A. MacDonald, Empire BuilderRead the text of a 1915 speech that offers a glowing tribute to Canada’s first prime minister. Includes first-hand observations of Macdonald’s public appearances and comments about the 1871 Treaty of Washington. From the Empire Club of Canada. MACDONALD, The Right Hon. Sir John AlexanderParliamentarian File for Sir John Alexander Macdonald. From the Library of Parliament website. Sir John Alexander MacdonaldUne biographie de John Alexander Macdonald, avocat, homme d’affaires et homme politique. Par le Dictionnaire biographique du Canada en ligne. Sir John A. MacdonaldWatch the Heritage Minute about Sir John A. Macdonald’s vision for a united Canada. From Historica Canada. 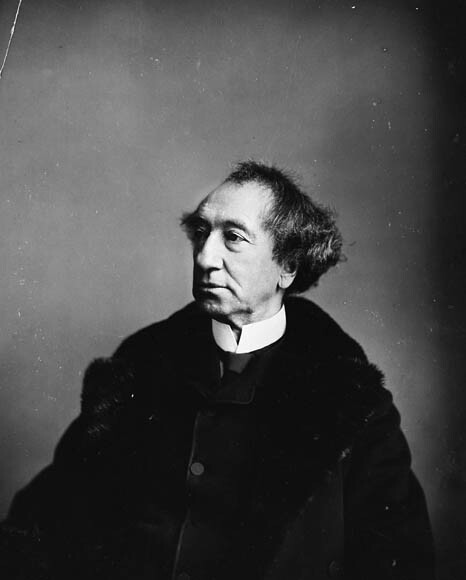 John A. MacdonaldSee excerpts from Donald Creighton’s 1998 biography of Sir John A. Macdonald. From Google Books. Sir John A.’s relationship with aboriginals needs a closer lookAn article about Sir John A. Macdonald’s complex relationship with Canada's Aboriginal communities. From the Globe and Mail.